If you like the look of this 3G-enabled smartwatch you really don’t have long to wait. The Samsung Gear S will be available on Friday. O2 and Samsung Experience stores will be selling the watch, which will let you reply to texts and will deliver notifications from your favourite social networks, calendars and applications. Inside there’s a dual-core 1GHz CPU, S Voice, Bluetooth 4.1, WiFi, Gyroscope, Accelerometer, Compass, Heart Rate monitor, light sensor and barometer. There’s also 4GB of internal storage and 512MB RAM powering the Tizen OS along with a 300mAh battery. Samsung tell us that you’ll get around 2 days use with this. The watch also includes GPS and S Health plus apps like Nike+ Running so you can track your runs. If you’re a fitness buff you’re going to like this. even when away from their phone. It lets users to instantly reply to incoming messages using the onscreen keyboard, or utilize enhanced S voice functionality to ensure tasks can be completed immediately. 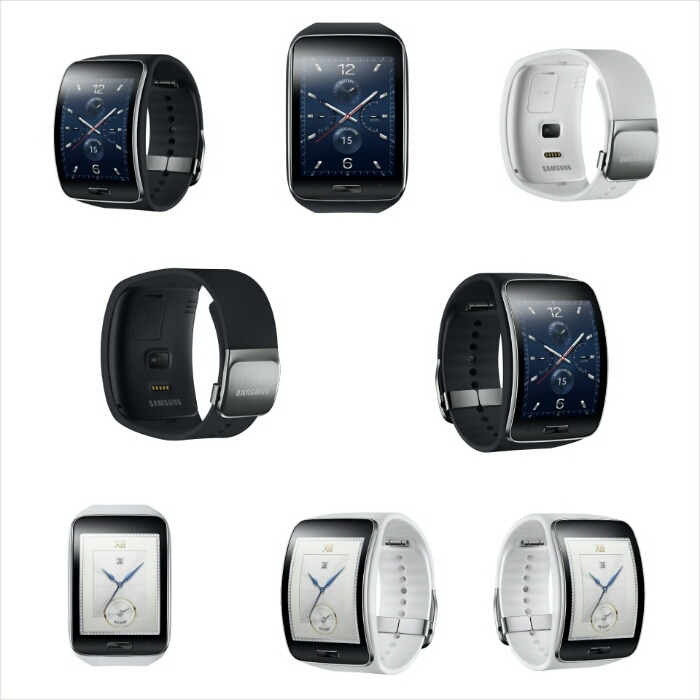 London UK – 5 November, 2014 – Samsung UK today announced that the Gear S will be available exclusively to Samsung Experience Stores, Samsung.com Shop and O2 customers from Friday 7th November, with other major UK retailers to follow. Delivering the most advanced wearable experience yet, the Gear S features 3G connectivity giving you the flexibility to carry out your day to day lives with much greater freedom. You can make and receive calls directly from your wrist and easily reply to SMS via keyboard or enhanced S voice functionality, plus the Gear S also automatically connects and syncs information once combined with your smartphone for seamless communication. Sporting a beautiful, curved Super AMOLED display, the Samsung Gear S offers a richer viewing experience and a bright, easy-to-use interface. It allows you to read messages and notifications in a single glance with features such as conversation view and condensed font. It’s chic, curved design fits comfortably around the contours of your wrist, whilst its customisable screen options and changeable straps mean you can express your own taste and style. As well as offering a range of connectivity options via 3G, Bluetooth, and Wi-Fi, the Gear S is also a perfect health and fitness companion featuring more enhanced multi-sensors, built in GPS, robust S Health features and applications like Nike+ Running so you can track your runs, measure your fitness and hear welcome workout motivation without your phone. Full details and product images are available at: www.samsungmobilepress.com. The Gear S will be available to buy for a recommended retail price of £329.